Line Follower Robot Glance - Line Follower Robot - a kind of robot which included into the category robotmobile are designed to work in an autonomous and have the ability to detect and move to follow (follows) the existing line on the surface. Control system used is designed to feel that there are pathways of movement and maneuver in order to remain able to follow that line. Robots of this type quite a lot of interest for those who are just learning to robot technology. Even competitions Line Follower Robot, often held regularly at various universities .In industry, robots of this type is often used to to move goods from one place to another. By modifying slightly the sensor line follower robot can then be developed into a Wall Follower Robot, a robot that can move around the wall. Sensors, can be analogous to the 'eye' of a robot that serves to 'read' the black line of the track robot. So that the robot is able to know when he will turn right, when he turned left and when he stopped. The sensor used is a light sensor mounted below the front of the robot, so as to find a bright line of a dark background or vice versa. Sensors used are usually photo reflector, R LD (Light Dependent Resistor), Photo Diodes and Photo Transistor - mounted on the front two or more under robotline follower. There also are using the camera as a sensor (or image sensor) to a higher-resolution readout line, making more accurate robot motion. 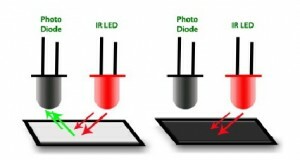 The working principle of the sensor is simple, when the transmitter (infrared) emitting light onto a white field, the light will be reflected almost entirely by the white areas. In contrast, Itter m ans when emit light to dark or black areas, then the light will be absorbed by the dark areas, so that incoming light kereceiver low. 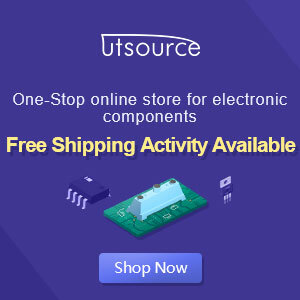 To be able to read by the microcontroller, the sensor voltage should be adjusted to TTL voltage level that is 0-1 volts for logic 0 and 3-5 volts for logic 1. This can be done by installing the operational amplifier is used as a comparator.